Brian Rubin: First off, could you give us the background of how your game came to be, such as what inspired you to create it and when you began working on it? Simon Lebettre: After I played Elite 2: Frontier on Amiga in 93, and with the ill-advised quantity of SF book I was reading (all of Frank Herbert in one summer for example) I had this recurring dream of a game where you can fly ships, and get on foot inside stations, land on planets, for some in character action and RPG. Then there is River World from Philip Jose Farmer, a world where people “respawn” and everything has to be built from the ground. Made me think of a game world where everything is built with Lego blocks…seemed impossible at this time. And of course, there is Star Wars. The sounds in space, rolling spaceships, force fields, tractor fields, simple gravity model, all that cheesy space physics that makes things so simple and action oriented – I’m using a lot of it in my game. I take inspiration from the movies, the Jedi Knight games, the lego ships, the books, everything. October 2010 : I discover ardorcraft – a Minecraft clone, before the real minecraft, because I was following the opensource 3d engine it was made with – I’ve been fiddling with hobby game projects and tutorials for years. February 2011: I got involved in Techcraft, a minecraft-like open source engine. To be brief and skip the drama, I’ve been fiddling on code 25 hours a week at night and on week-ends most months of the year, with few other guys, all programmers from the business world, trying to do a voxel fantasy game – without any direction. It went nowhere, but we all got a lot of new coding experience. The result of all that: I know a lot about coding and producing games now, even on the professional side. May 2013: Switch to unity 3d – The intermediary colored cubes design. 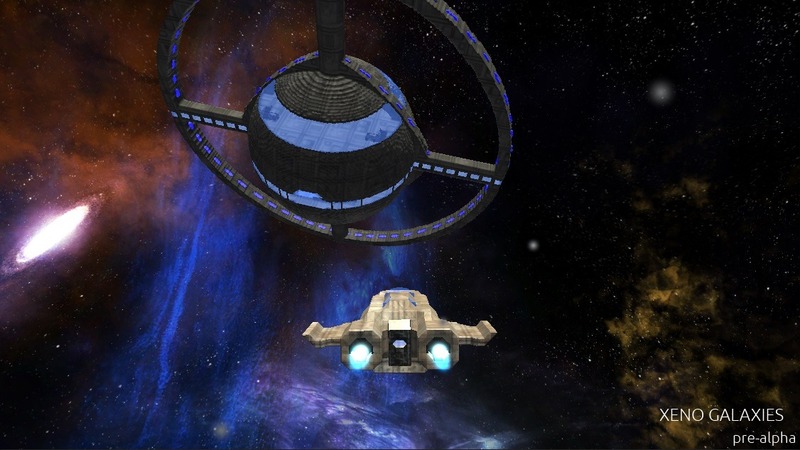 Aug 2013: Final reboot – that’s when I started working on Xeno Galaxies as it is now (smooth terrain, multiple block shapes, construction tool, professional assets). I started slow – still working at the game startup at first – and over time I worked more and more on it, and now I’m working full time. Oh and one more thing : I discovered “Saga of the Seven Suns” form Kevin J Anderson just recently – I did take a break from my evening Xeno Galaxies coding sessions to read all the saga, and it is a very important source of inspiration now. Brian: This is a game where you can build all sorts of things, such as ships, cities, space stations and so on. How easy is it to build a ship, for example, and will the game include pre-made designs for folks like me to don’t have the patience to build stuff? Simon: With the blueprint design system – the “engineering console” – it’s super easy to design things. It has things like copy/paste, undo / redo, a mirror tool, line tool, and a magic wand to grab a whole construction and duplicate it. It’s like having a modding tool included in the game. But it goes farther than that: blueprints are trade-able in game. Even in single player mode, there is a web based blueprint store integrated in the game. So you can purchase official blueprints and blueprints made by other players. It’s all in game galactic credits, no real $ involved at all. So concretely, you can use a cheap blueprint of a ship hull and customize over it, or just use a blueprint of a whole ship. There is a ship design demo/tutorial here. Blueprints are just recipes, you need the raw materials to actually build the ship and use it in game. Having design separate from actual construction allows very interesting gameplay ideas, like scanning other ships to reverse engineer a blueprint. Brian: So tell me about the missions you can complete in the game. Will you be able to complete missions while flying in space (such as destroying another ship) as well as on foot (like the infiltration mission in the remix video)? Simon: Yes. And I’m focusing on the on foot content first. Clearing a ship of Insectoids, defusing a bomb, destroying a rogue IA that turns turrets on you, liberating hostages. Brian: Will you be able to control larger, capital style ships such as cruisers with turrets, or even carriers with fighters, for example? Simon: Yes. But that’s not the primary focus in the first alpha releases. Brian: How large are the galaxies you’ll be flying around in, and will they contain populated elements such as populated planets, space stations and other ships? The game will spawn space stations, ships and outposts on the planets, randomly from the blueprint database. Btw player made blueprints will be moderated. You will have lootable navigation maps, holodisks indicating destinations, and a good navigation / radar system. Brian: Can you please tell us about the AI that will be flying around the universe with and against you? Simon: I can tell you about the global trading AI: it will simulate market fluctuations between stations and outposts, like if ships were traveling, buying and selling stocks from point to point. Then Soldier AI with retreat to cover and calling for help. Space combat will come later. If I get funded I will be able to hire some help on this. Brian: What can you find by landing on a random planet? Loot? Materials? Can you claim planets? I saw you can build cities, so what does that entail? Materials: you can mine at will. But you can’t move all the cargo. So just take the rare elements. Brian: Your site mentions you can board an alien mothership? What can you do when you board other ship? Do you just loot them, for example, or can you take them as your own? Simon: It depends if you can understand the technology. So at first you won’t be able to take it, you will need to do some research. If you don’t break everything. Simon: Single player at first. Cooperative small scale multiplayer in a future update, depending on funding (kickstarter extended goal). It will never be a mmo, and I doubt I will be able to balance a PVP mode with a game so dynamic. Brian: What kind of weapons will be available to you both in first person and in space combat modes? Brian: As the game is coined a role-playing game, what kind of stats can the player improve themselves in? Morrowind style – the more you do it, the better you become. Brian: Finally, how far along is the game, and when do you see it being final? Can one buy into early access now? The dates depend on the success of the Kickstarter – I need to be able to continue working full time on it and to have a budget for hiring some punctual help. But if it fails I will not cancel the game, I will find another way! Alpha in iterations – 1st one estimated in august, exact scope to be defined. Beta estimated in October (same thing – To keep the date, you need a flexible scope). Final: no estimate at all. Some New Spacey Games I Found to Share With Y’all!